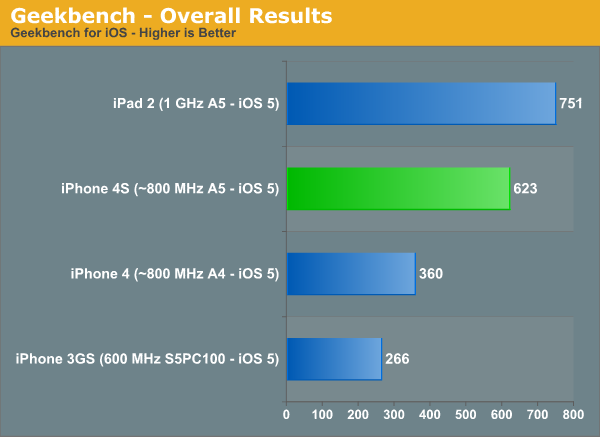 The first GeekBench benchmarks for the iPhone 4S seem to be rolling in. At present, two iPhone4,1 (4S) benchmarks have been posted and seem, at first glance, to be legitimate. The listed specs show a dual core processor that resembles the results from from the iPad 2 which also shares an A5 processor. Free RAM appears to be in-line with what we believe (512MB) and the benchmarks line up with known devices. 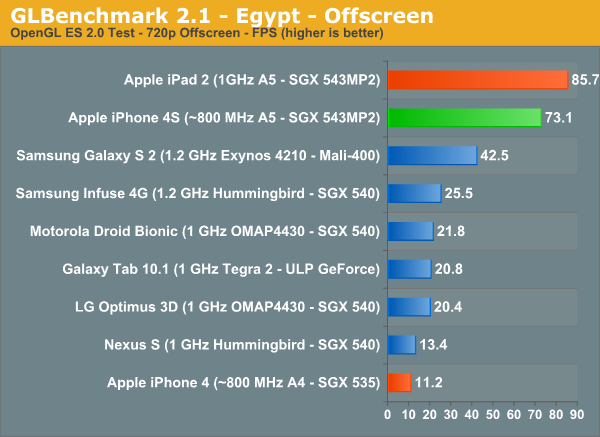 The iPhone 4S receives a total Geekbench score of ~622. This falls slightly below the iPad 2 scores of 749, but well above the iPhone 4 benchmarks of 370. So, the new iPhone seems to benchmark about 68% faster than the iPhone 4, and about 17% slower than the iPad 2. The iPhone 4S A5 processor is likely underclocked (800MHz) as compared to the iPad 2 processor (1 GHz), explaining the slightly lower performance. The iPhone 4S is currently shipping to customers for delivery on October 14th, but it seems at least a few units are already in the wild. Meanwhile, graphics performance of the iPhone 4S is confirmed to be about 7x faster than the iPhone 4.